Medtronic ist eines der größten Medizintechnikunternehmen der Welt. Bei Herzschrittmachern und Defribillatoren ist das Unternehmen mit einem Weltmarktanteil von über 50% unangefochten Marktführer. Das Unternehmen erzielt seit Jahrzehnten stetig steigende Umsätze und Gewinne. Der Aktienkurs jedoch ist seit über 10 Jahren im ständigen Sinkflug. Die Marktkapitalisierung in 2010 befindet sich bei rund 40 Mrd. USD. Anders als der Chart suggeriert ist die Gewinn und Umsatzreihe jedoch enorm stabil. Sie haben auch in 2010 schon ordentlich verdient Q1-Q3: ~2,40 USD –> Guidance etwas über 3 USD für 2010. Die Guidance für 2011 liegt bei 3,45 bis 3,55 USD. – Absolut teuer unter Substanzgesichtspunkten KBV/KUV und KGV10 etc. – Large Cap, sehr gut researched, wenig Möglichkeiten hier einen Vorteil zu erlangen. Hier Transaktionen der letzten 2 Jahre. Das sind in den letzten 2 Jahren Akquisitionn für ca. 2,8 Mrd USD oder ganz grob 50% des freien Cashflows. Waren die Akquisitionen nicht werthaltig – wurde also Geld der Aktionäre verbrannt. Uns gefällt diese Tatsache nicht und erklärt auch, wieso trotz relativ hohen freien CFs die Verschuldung nicht sinkt. Oftmals gehören solche “Serial Akquirers” nicht zu den besten Anlagen. Umsatzwachstum 2000 bis 2010 ~ 12% p.a. Die Netto-Umsatzmargen von verschiedenen Unternehmen in der Medizintechnikbranche in den letzten 5 Jahren waren bei zahlreichen Unternehmen ähnlich stetig. –> geht man von einem stetigen Umsatzwachstum i.H. von 7% aus. (-40% Steigerung des Gewinnwachstums), dann würden in 2015 rund 22 Mrd. USD verdient. Durch die geringeren Margen wg. Gesundheitsreform und zusätzlichem Margendruck lassen wir die Margen von diesem Jahr auch um 40% auf 12,5% im Schnitt sinken. es folgt ein Gewinn von ~ 2,75 USD bei gleichbleibender Aktienzahl. Ein gleichbleibende Multiples: 12 würde dann einen Kurs von 33 USD bedeuten. Dies würde in etwa gleichbleibenden Kursen entsprechen. Die Dividende wäre die einzige Rendite die der Aktionär erhalten würde. Wenn man den Siemens GB vergleicht, macht Siemens im Healthcare Bereich 12.4 Mrd. EUR Umsatz und 750 Mio EUR Gewinn, das Jahr zuvor haben sie bei bei 11.8 Mrd Umsatz 1.45 Mrd. Gewinn gemacht, das ist im Schnitt 6% bzw. 12% Nettomarge. Philips zeigt 2007-2009 10.7%, 8.1% und 7.5% Nettomargen im Healthcare geschäft aus. Aktueller Umsatz ca. 15Mrd. USD. Nettomarge pendelt sich bei 8% ein, 5% Umsatzwachstum. Dann wäre ich in 2015 bei ca. 19.1 Mrd Umsatz und 1.528 Mrd. Gewinn bzw. 1.42 USD pro Aktie Gewinn. Bei einem 12er Multiple ein Kurs von 17 USD. Ein Screeningmodeel kommt auf einen fairen Wert unterhalb des aktuellen Kurses. Vorallem aber wegen extrem hohen KUV/KBV und Goodwill. Das Modell kommt mit der reinen Ertragswertspekulation – die MDT unserer Meinung nach ist – nicht so gut klar. Nichts desto trotz nehmen wir Medtronic als eine Portfolioposition in das Depot auf. Hier muss allerdings klar sein, dass es sich eher um einen günstigen “Growth-Wert” (Mit Chance auf Bestcase) handelt – als um eine klassische Valuesituation. This is an overview with short comments for the current portfolio. We will add detailed analysis for the positions in the coming weeks. European market leader producing and whole selling wallpapers. Family owned, cheap valuation with continuous growth. Currently issues with the German anti trust authority which lead to a drop of ~15% in the share price. Italien based cement producer. Family owned, cheap on the basis of historical valuation. Exposure to problematic Italian and US markets, however strong presence in Germany through Dyckerhoff subsidiary. Low debt and goodwill compared to other cement companies. Swiss based specialist for glass packaging. Strong profit growth in the last couple of years but still relatively cheap. Currently issues due to strong Swiss Franc. Costume jewelery and accesoires retail chain, former growth „star“ company. Peak of sales and profit in 2008, since then shrinking sales and profits. However, company produces lots of cash and is relatively cheap. 100% equity financed, family ownership, attractive dividend yield and share repurchases make the stock attractive. Global market leader for pump systems. Typical German „Mittelstand“, meaning low debt, no goodwill and family owned. Produces among others pumps for power plants. Listed subsidiary in India. Family owned frozen food producer, who survived a crisis in the years 2000-2003. Famous in Germany for frozen meals without artificial condiments. Strong market position and brand name in Germany and Poland. Relatively cheap valuation. US Offshore oil drilling oil service company. Almost no debt, currently depressed share price because of Deepwater Horizon accident. Also large position of David Einhorn’s Greenlight. Solid German building material company with cheap valuation, high dividend yield and consistent earnings. German Home improvement store chain with cheap valuation combined with reasonable profit growth. Austrian Gas and Oil company. Strong presence in Southern-Eastern Europe, especially Oil drilling in Romania. Utility from Finland with high percentage of renewable and nuclear power generation. Within the European peer group extremely low Carbon emissions. Currently build up of capacity (natural gas) in Russia. Not really cheap but attractive as share price has suffered due to general problems in the utility sector. Apogee designs and develops architectural glass and other building glass installations. Currently in the low of the business cycle as glass facades are completed at the end of an construction product, cpacity utilization at the moment only around ~50%. Apogee now concentrates on “value added” glass, especially insulation in order to save energy. Similar story as Sto Vz. Global market leader for manufacturing oak barrels (Barrique). Vertically integrated business from the production of wood to recycling barrels into wooden chips. Cheap valuation, very stable margins. Market leader for many types of medical products. Fundamentally not really cheap but cheap compared to historical valuations. High margins, benefits from demographic trend. Company produces low cost handyman and craftsmen tools. Distribution through all major discount chains and home improvement stores. Constant earnings and growth for a cheap price. Family owned tanker fleet operator from Greece. Very cheap valuation, however difficult market and surprising capital increases make the stock risky. Traditional German manufacturer of silverware and other household wares. Through clever acquisitions, WMF succeeded to enter the market for professional coffee machines. WMF also operates its own retail stores. Former star performer with provocative marketing campaigns. After 10 years of share price declines, stock is fundamentally very cheap incl. a good dividend yield combined with low debt and low goodwill. Company has significant presence in BRIC markets, which could offset further decline in its home market Italy. Utilities were on average one of the most underperforming sectors. Cheap valuations, stron cash flows and high dividend yields however make the sector attractive. High goodwill and significant debt create risks as well as in some cases questionable investments into emerging markets projects. Former “AIG Real Estate”. A traded closed real estate investment fund. No direct links or exposures to AIG. Real estate portfolio consists of international projects around the globe. A lot of the investments are highly leveraged but have been written down substantially in some cases even completely. More than 50% of the remaining NAV is concentrated in one object in Bratislava where refinancing is due in 2011. One of several open real estate investment trusts which had to be closed down due to overwhelming redemption request. Portfolio is relatively solid and fund is priced ~50% of NAV. Small chance for reopening until November 2011. Non-rated Convertible bond issued by a large German real estate company, maturity 2107. No option value as exercise price is 10 times current share price. Bond holder have put right at par in 2014, yield at current prices ~11% p.a. which is significantly more than for corporate bonds with the same risk profile. 100k EUR min . notional. Officially default rated (“C”) Hybrid bond from Commerzbank who has already suffered a principal write down of about 15%. Specialty: Bond still pays coupon due to guarantee fram Allianz SE. Further risk for writedowns limited. If Commerzbank starts to pay dividends in 2012 as expected by equity analysts, bond will have to be written up to 10% before that. Classical capital structure “arbitrage”. Participation rights receive 10 times the dividends of the listed pref shares of Draeger but only costs twice as much. However some issues about dilution provisions exist. In 2011, significant cash out (dividend + compensation for capital increase of 2010) is expected. Starting 2011, we want to try to gather our investment ideas into a portfolio. We own most of the stocks which are included in the portfolio on this blog. However, we do not advise any reader to invest into this securities. Should a reader decide to invest into any of these stocks, we strongly recommend to do his or her own research and we do not assume any responsibilities for any losses. DO YOUR OWN HOMEWORK !!! Some of the securities are only thinly traded and the amounts and weightings in the portfolio might not necessarily represent our own positions in our real portfolios. We have chosen the size of the portfolio to be 10 mn EUR in order to simulate realistic purchases and sales of securities. A lot of securities mentioned in this blog will have to be traded over a couple of days in order to reach the desired size, even within this relatively modest size for a fund. However, as we want to create a real Track Record, we decided to implement this minimum size of the model portfolio. 7)	max. trading limit: 15% of VWAP per day. We assume that within this limit we could trade without moving the stock price. We try to achieve a higher return for our portfolio against this benchmark, We also try to realise lower volatility of returns. In between, portfolio and benchmark will differ significantly as many of the investments will not be included in the benchmark and wil have little or no correlation to those benchmark securities. Our investment philosophy is based on fundamentals and “value” based. 75% of the portfolio should be allocated into stocks of “good” or even “great” companies whose share price is lower than what we would consider as fair value (“Core value”). 25% of the portfolio shall be dedicated to special situations (“Opportunity”). We try to achieve a “margin of Safety” at current market prices, which should protect us if adverse changes happen to the companies or the economy as a whole. Zementwert aus Italien. In Familienbesitz und auf Basis vieler Value Kennzahlen historisch sehr billig. Neben dem problematischen italienischen und US-amerikanischem Markt auch über Dyckerhoff stark in Deutschland vertreten. Für einen Zementhersteller relativ wenig Schulden und Goodwill. Jedoch mit guten Bilanzkennzahlen überlebensfähig. Ehemaliger Wachstums- und Börsenstar. Nach dem Peak in 2008 jetzt allerdings stagnierender Umsatz und leicht sinkende Gewinne. Firma ist allerdings eine klassische “Cash Cow” und mittlerweile vergleichsweise günstig. Eine makellose Bilanz (EK-Quote praktisch 100%), Familienbesitz hohe Dividende und Aktienrückkäufe runden das Bild ab. Weltmarktführer für Pumpensysteme: Typischer exportstarker Mittelständler mehrheitlich in Familienbesitz, also wenig Goddwill und kaum Schulden. Partizipiert u.a. mit den Kraftwerkspumpen am Infrastrukturboom. Börsennotierte Tochtergesellschaft in Indien. Familiengeführter Tiefkühlspezialist der erfolgreich eine Krise in den Jahren 2000-2003 überstanden hat. Bekannt durch seine Gerichte ohne Zusatzstoffe. Starke Marktposition neben Deutschland auch in Polen. Bewertung im Vergleich sehr günstig. Günstiger Versorger aus Österreich mit Tochtergsellschaften in Südosteuropa. Mehrheitlich in Staatsbesitz, weiteres großes Paket liegt bei EnBW. Hält 11.5% an Verbund, einem anderen Östereichischen Versorger. In Summe eine günstige Bewertung und stetige Dividendenzahlungen. US Offshore Ölbohr und Service Gesellschaft. Keine Schulden, derzeit durch das Deepwater Horizont – Desaster recht günstig bewertet. Große Position auch bei Hedgefonds Superstar David Einhorn. Solider Baunebenwert mit günstiger Bewertung, guter Dividende und konstanter Entwicklung. Solide geführte Baumarktkette mit günstiger Bewertung bei gleichzeitig sehr ordentlichem Gewinnwachstum. Österreichisches Energieunternehmen. Stark in Südosteuropa investiert, v.a. Ölförderung in Rumänien. Familiengeführter Spezialist für Dämmstoffe. Hauptprofiteur von staatlich geförderten Energiesparmassnahmen. Allerdings schon gut gelaufen, aber immer noch nicht teuer. Hausdämmung ist das Nr. 1 Thema für Energieeinsparungen und daher ein Zukunftsmarkt! Finnischer Versorger mit hohem Renewable und Atomstromanteil. Im Europavergleich extrem “CO²-günstige” Stromerzeugung. Derzeit größeres Engangement in Russland in der Investitionsphase. Nicht billig aber dennoch sehr interessant, da Kurs unter allgemeiner Versorgeraversion gelitten hat. Glasfassaden und Glasfassadenbau in den USA. Aktuell im schlechtesten Teil des Zykluses, da Glasfassaden erst als letztes an ein Gebäude angebracht werden – die Aufträge im Moment also sehr gering sind. (Auslastung 50%). Jedoch Konzentration auf “value added-Glas”, das Dämm und damit Energievorteile mit sich bringt. Ähnliche Story wie bei Sto VZ. Weltmarktführer (20%) für die Produktion von Eichenfässern. Vertigrale Integration von Holzproduktion und Nachfolgeprodukten (Barrique-Chips). Günstig bewertet mit extrem stabiler Marge. Weltmarktführer für Herzschrittmacher. Nach rein mechanischen Kennzahlen nicht unbedingt “billig” – aber im historischen Schnitt günstig bewertet. Hohe Margen und durch Demographie ein weiter wachsender Markt. Billig Akkuschrauber und Heimwerkerbedarf. Das Unternehmen fertigt für alle Discounter und ist auch überregional vertreten. Neben konstantem – verlustfreiem – Gewinn- und Umsatzwachstum spricht eine günstige Bewertung für das Unternehmen. Familiengeführter Tankerreeder aus Griechenland; Nach Bilanzkennzahlen “saubillig”. Jedoch durch eine Kapitalerhöhung zur Unzeit und einen sich nicht erholenden Markt nicht ohne Risiko. Schwäbischer Traditionshersteller von Haushaltswaren aller Art, insbes. Besteck und Töpfe. Durch kluge Akquisitionen ein zwietes Standbein im Bereich Profi-Kaffeemaschienen aufgebaut. Mit eigenen Verkaufsfilialen am Start. Ehemaliger Börsenstar und Werbe-“Enfant Terrible”. Nach mittlwerweile 10 Jahren Kurs- und Umsatzrückgängen technisch sehr billig inkl. ordentlicher Dividende und wenig Verschuldung/Goodwill. Abwärtstrend könnte evtl. durch relativ hohes Engagement in BRIC-Ländern gestoppt werden, trotz Rückgängen im Heimatmarkt Italien. Versorger sind im Schnitt schlecht gelaufen. Günstige Bewertungen, hohe Cashflows und Dividendenrenditen lassen den gesamten Versorgersektor günstig erscheinen. Risikoreich ist insb. der hohe Goodwill bei vielen Einzelunternehmen. Ungewiss ist zudem ob das Geld der Aktionäre nicht in unrentable Projekte (E.ons Investition in Schwellenländer) gesteckt wird. Ehemals “AIG Real Estate”, hat aber keine Verbindungen mehr zur AIG. Eine Art geschlossener Immobienfonds, Discount von 50% auf den bereits stark herabgeschrieben NAV. International diversifiziertes Portfolio, allerdings stark gehebelt. Klumpenrisiko in Bratislava. Phantasie durch evtl. Verkauf des größten Objektes und evtl. Auflösung der Gesellschaft. Aus der Gruppe der “ehemals offenen Immofonds” der Fonds mit dem höchsten Abschlag zum NAV bezogen auf das Jahresende 2008. Im Gegensatz zu den schon endgültig geschlossenen Fonds noch eine ganz kleine Chance auf Wiederöffnung oder Umstrukturierung. Höhere Vermietungsquote als der Degi Europa. Offener Immobilienfonds mit sehr guten Chancen zur Wiedereröffnung in 2011. Convertible aus dem Jahre 2007. Laufzeit bis 2017, Kündigungsmöglichkeit durch den Anleger aber in 2014. Wandlungspreis bei 45 EUR, also ein reiner Bond ohne Optionswert. Im Gegensatz zu anderen Corpororate Bonds bekommt man hier noch gut 11% p.a. für gut 3 Jahre Restlaufzeit. Kindersicherung: 50.000 € Nominal. Nachrangpapier der Commerzbank mit einer (wichtigen) Besonderheit: Der Coupon ist durch die Allianz garantiert und beträgt zur Zeit ca. 5.3%. Es drohen evtl. noch weitere Herabschreibungen beim Nominalwert, aber bevor der Aktionär der Commerzbank auch nur einen Cent Dividende bekommt muss das Papier wieder “aufgefüllt” werden. Aktienanalysten rechnen in 2012 mit der ersten Dividende. Klassische Kapitalstrukur “Arbitrage”. Die Genussscheine verbriefen das Recht, das 10-fache der Vorzugsdividende zu bekommen. Theoretisch könnte der Schein also auch bei diesem Multiple gegenüber der Vz Aktie Notieren (10*63 EUR). Das er das nicht tut, liegt vmtl. u.a. an der etwas unklaren Verwässerungsregelung. In 2011 dürfte es eine ordentliche Ausschüttung geben, inkl. einer Ersatzleistung für die Kapitalerhöhung. A.S. Création produziert Tapeten und Bordüren in allen Materialqualitäten und für alle Anwendungsbereiche. Der Geschäftsbereich Dekorationsstoffe handelt darüber hinaus mit hochwertigen Dekostoffen. Durchsuchung Bundeskartellamt: Ende November hat die Tapeten AG bekannt gegeben, dass das Bundeskartellamt ermittelt, ob es in der deutschen Tapetenbranche zu kartellrechtswidrigen Absprachen bzw. abgestimmten Verhaltensweisen gekommen ist. Der Verdacht beruht nach Angaben des Bundeskartellamts u.a. auf Hinweisen eines Tapetenherstellers. Die Untersuchungen betreffen den Zeitraum seit 2005. Im Zweifel kann das Kartellamt eine Strafe in Höhe von 10% des zu betreffenden Umsatzes verhängen. Hierbei wird aber jeweils auf eine Tragfähigkeit der zu zahlenden Strafe geachtet. Hinsichtlich des Verfahrens gibt es zwei Aspekte. 1. Ist die tatsächliche Strafzahlung, der den Gewinn mindern, bzw. einen Verlust erzeugen wird. Dies könnte je nach Sachlage im schlimmsten Fall einen oder mehrere Jahresgewinne ausradieren (10% des Umsatzes seit 2005). 2. Aus unserer Sicht viel wichtiger ist aber, ob die in der Vergangenheit erzielten Margen durch freien Wettbewerb zu Stande gekommen sind, oder ob die Margen in der Vergangenheit künstlich überhöht waren. Für den Badcase gehen wir daher mit einer durchschnittlich geringeren Marge bei gesunkenen Umsätzen aus. Bestcase: Russland-Jointventure und Frankreich-Akquisition “fruchten”. Das Unternehmen schafft es seine Marktposition zu halten bzw. auszubauen. Die Umsätze werden jährlich um 5% p.a. gesteigert, die Marge zu halten. zzgl. Dividendenzahlung von ~3-5% p.a. Midcase: Russland-Jointventure und Frankreich-Akquisition gleichen die stagnierenden Umsätze aus dem allgemeinen schlechten Wirtschaftsumeld aus. 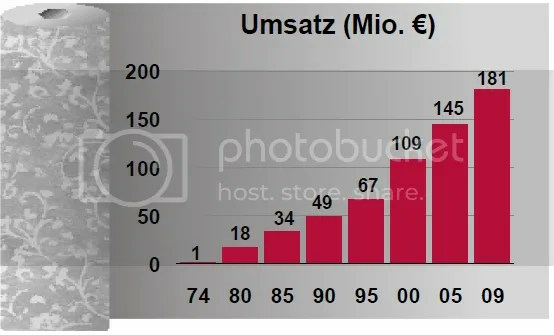 Umsatzwachstum = Inflation = 2% Das Unternehmen kann die in der Vergangenheit erzielten Margen nicht mehr halten, erwirtschaftet aber dauerhaft Margen die in den schlechten Zeiten 2003 und 2009 erreicht wurden. zzgl. Dividendenzahlung von ~3% p.a. Dividendenzahlung fällt wegen Kartellstrafe aus. Dieser Wert geht in etwa mit dem Wert in unseren jeweilig verwendeten “Scoring-Modellen” für AS Creation überein, die einen Wert von rund 40 Euro ausgeben. Marktanteil (Zitat: Nebenwertejournal) beträgt ca. 31 % Nach der letzten Konsolidierungsphase kämpf ten jetzt stärkere Wettbewerber als in der Vergangenheit um Marktanteile. Da alle deutschen Tapetenhersteller dem VDT angehören liegen verlässliche Zahlen vor, die im Export einen Umsatzrückgang auf € 246.9 (332.4) Mio. zeigen, während im Inland mit € 148.2 (144.8) Mio. etwas mehr umgesetzt wurde; saldiert schrumpfte der gesamte Umsatz um 17.2 % auf € 395.1 (477.2) Mio. Unter den deutschen Wettbewerbern verfügt A.S. Création über einen Marktanteil von ca. 31 % und liegt nach Umsatz gerechnet um 27 % vor dem zweitgrößten Hersteller. Stärke: Zersplitterte Branche mit hervorragendem Marktanteil – die Wettbewerber sterben wie die Fliegen. Auf Grund der Stabilität des Geschäftsmodells übernehmen wir die AS Creation daher als “Core-Value” mit einem Startanteil von 7% für das Gesamtportfolio auf. Disclaimer: Die hier vorgestellten Aktien werden in einem abweichendem Volumen und einer abweichenden Gesamtdepotgewichtung bei mindestens einem von uns beiden gehalten. AIRE steht für ehemals “AIG Real Estate KGAA”, also ein von einer AIG Tochter gemanagtes Immobilienvehikel. Allerdings bestehen wohl keine direkten Verbindungen zu AIG, insbesondere keine Forderungen o.ä. Nach einem Verlust pro Aktie von 4,54 EUR in 2008 wurden 2009 sage und schreibe 10,95 EUR Verlust in 2009 ausgewiesen, bei einem aktuellen Kurs von ca. 9,40 EUR. Investiert wurde hauptsächlich in US-amerikanische Immobilienprojekte sowie Asien und ein bisschen Europa. – erklärtes Ziel des Managements ist es, das Vehikel auf Sicht von wenigen Jahren aufzulösen und das verbleibende Nettovermögen auszuschütten. -die Bewertungen entsprechen diesem Ansatz, es wird also (zumindest zum großen Teil) nicht zum “Ertragswert” sondern zum Liquidationswert bewertet. -man kann das im Geschäftsbericht auch recht gut nachvollziehen, so sind die kririschen US Immobilien mit ca. 36% des ursprünglichen Kaufpreises bewertet. – insgesamt ist das Unternehmen für eine Immobiliengesellschaft erstaunlich transparent. Über die Homepage erhält man zu allen relevanten Objekten recht detailierte Infos. Ein Knackpunkt ist allerdings, dass ein großer Teil der Fremdfinanzierung (meist 3MEuribor+1%) in 2011 fällig wird und auch noch für einige Investionen Investitionsverpflichtungen in durchaus nennenswerten Umfang bestehen. Da der laufende Cashflow aber positiv ist und auch in 2009 einige Projekte erfolgreich veräussert werden konnten, besteht Grund zur Hoffnung, dass hier bei gleich bleibenden Marktkonditionen (Ausbleiben eines Credit Crunchs) zumindest eine Anschlussfinanzierung möglich sein sollte. Zu guter Letzt ist hervorzuheben, dass die Aktie noch nicht auf die aktuellen (Seit Oktober 2010) Verschiebungen der Währungskurse reagiert hat. Trotz Fremdwährungsfinanzierung müsste hier in EUR ein positiver Effekt zu spüren sein. In der Einzelimmobilienliste stehen 77 Mio Eur Werte der Einzelimmobilien, davon ca. 27 Mio ein Objekt in Bratislava. Die Aktivseite ist mit 78,5 Mio (Immobilien als Investment) + 4 Mio. Goodwill also 82,5 Mio bewertet. Da alle Schulden der AIRE auf dieses Projekt entfallen, kann man also die 57 Mio. Schulden abziehen und hat ungefähr die Überleitung zu den 27 Mio EUR in der Einzelliste, die einen “Net Asset Value darstellen. Die Einzelliste ist hier natürlich irreführend, weil brutto das Bratislava Objekt dann ungefähr 61% des gesamten bilanzierten Immobilienvermögens ausmacht. Der Schlüssel zur Bewertung der AIRe liegt also auf dem Objekt Bratislava. Lt. GB und Quartalsberichten werden darauf gut 8-9 Mio. EUR Brutto Miete p.a. erzielt. Es handelt sich um den “Zulieferer Park” rund um das VW Werk und ist bisher anscheinend voll vermietet. Einziges Problem ist, dass die Finanzierung komplett in 2011 fällig wird. Dennoch denken wir, dass dieser Wertansatz (gut 10% Nettomietrendite) akzeptabel ist und dem Risiko der offenen Refinanzierung Rechnung trägt. Über das Objekt hinaus hat man noch ca. 30 Mio. Immos in USA sowie knapp 17 Mio EUR in Asien. Alle Projekte sind anscheinend strukturierte Investments, d.h. man partizipiert überdurchschnittlich wenn es gut läuft, verliert aber alles wenn es schlecht läuft. D.h. die Objekte die auf Null abgeschrieben wurden, sind auch tasächlich nichts wert. Von dieser Seite ist keine Recovery zu erwarten. Bei den größeren Objekten scheinen uns die Annahmen aber hinreichend konservativ. Bei einem der “überlebenden” Projekte schreibt AIRE z.B., dass die zu erwartenden Cashflows mit 20% abgezinst werden. Anders als bei vielen Substanzspekutionen gibt es bei der AIRE durch die geplante Abwicklung einen konkreten Katalysator der dieses Opportunity-Investment letztlich so attraktiv macht. Zum Thema des Exits: Bislang wurde wohl hauptsächlich ein Projekt in Singapur erfolgreich verkauft, hier scheinen letztes Jahr 13 Mio EUR geflossen zu sein, was hauptsächlich in den Schuldenabbau gesteckt wurde. Das Objekt in Bratislava hat über die Laufzeit wohl auch schon gut 15 Mio ausschüttbare Gewinne erzielt. Im Laufe des Jahres 2010 hat Hubert Grevenkamp (u.a. auch engagiert bei Nordwest Handel u.a. Substanzspekulationen) gut 5% zusammengekauft. Zu guter Letzt noch zum “Katalysator” für eine in absehbare Zeit steigende Kursentwicklung der letzte Satz des Q3 2010 Berichtes. Die Immobilie rund um den VW-Autopark steht mit 26,6 Mio in den Büchern, das sind gut 50% der Aktivseite. Die Mieteinnahmen für das Objekt betragen für die ersten 9 Monate 6,6 Mio EUR, hochgerechnet also ca. 9 Mio. Das sind 11,5% Mietrendite p.a. Dabei könnte bei einem Verkauf der Buchwert erreicht werden. Das wiederum könnte mit einem signifikanten Cashrückfluss und einer Ausschüttung für die Gesellschaft verbunden sein. Wir übernehmen die AIRE KgAA daher als “Opportunity-Investment” mit einem Startanteil von 3% für das Gesamtportfolio auf. Kaufaufträge bis zum Erreichen des Volumens werden ab dem 01.01.2011 eingestellt.